Once only royalty wore skirts with trains. The longer your train, the greater your status. In 2011, trains are worn by royal and non-royal alike. Current fashion shows trains on skirts that are worn as separates as well as trains on skirts that are attached to a bodice (dresses). Trains can add drama, whimsy or fun to evening wear. At the most formal special occasions, trains still convey a regal sense of timeless beauty and elegance. Anyone can add a train to a skirt -- the degree of complexity is determined by your vision of what a train looks like. Determine the length and fullness of your train and whether the train will be detachable. Make a train pattern from newsprint paper. Hold the pattern up to your body to evaluate the way it looks. Tape additional sheets of paper together to make a more voluminous train. 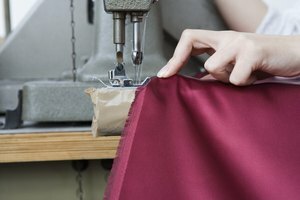 Add volume to your train using one or more of these methods: gather fabric at the waist, add deep pleats or cut V-shaped panels of fabric that are narrow at the waist and wide at the hem. Design an even, smoothly rounded or elliptical hem edge. When making your paper pattern, attach a piece of string at the center back waist and put a pin through the other end of the string at the bottom of the hem. Hold the string taught and move it around the hem of your train pattern, marking the bottom of the hem with a pencil every 4 to 6 inches. To make an elliptical train, gradually move the pin up the string as you work your way around the hem, shortening the hem length as you go. Mark one-half of the pattern; then fold the paper pattern in half, pin and cut along the marked hemline. Add a train, but keep the lines of the skirt simple. Add all the length and width required by this style of train at the base of the skirt. Follow current fashion trends, and add a train to a short skirt. Make a simple straight train or a train with a great deal of volume. Decide whether you want your train to be detachable or incorporated with the skirt. 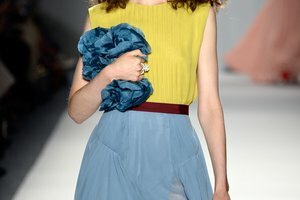 Make a short train on the skirt of your garment to add softness and elegance. Walking is easy in a skirt with a short train. Create deep pleats at the waist of the skirt to add fullness. The more sets of pleats you add and the deeper the pleats the greater the fullness in the skirt and train. 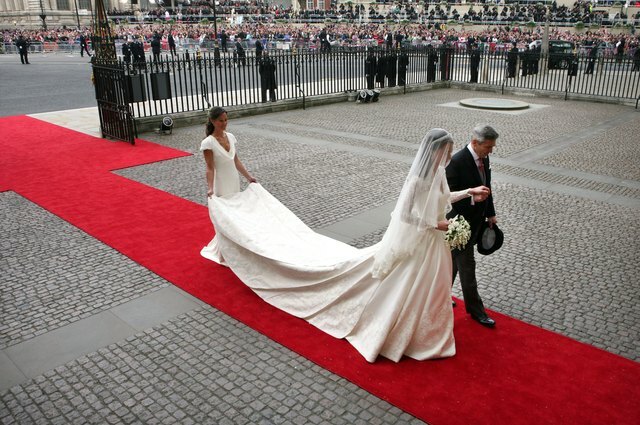 Note the deep pleats in Duchess Catherine's wedding dress. 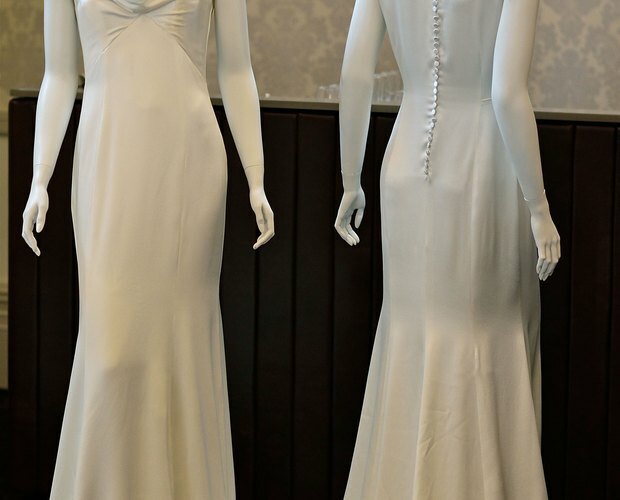 Make a detachable train on evening wear or a bridal gown if you want to be able to dance and move around unencumbered after you walk the red carpet or after your wedding ceremony. Detachable trains may be removed altogether or doubled up on themselves by attaching hooks near the middle of the train and eyes in an inconspicuous location at the waist. Make a detachable train by marking the length and finished width of your train on newsprint. Add additional width if you intend to gather or pleat your train. Imagine this dress without a train to understand the steps required to add a train. Note how the back hem was lengthened and how the skirt in the back is much wider than the front of the skirt. To add width to a skirt pattern, cut a vertical line from the bottom of the skirt pattern up as far as you want the additional volume to go (the slash in the pattern should start at around the knees for a sleek dress or may go all the way up to the waist for a full skirt). Spread the pattern and tape newsprint paper underneath to fill the open area where you have split the pattern. Make a muslin piece using your altered pattern to ensure that you have created the look you want before cutting your expensive fabric. Increase the width of the back of your skirt pattern to allow gathering or deep pleats to add fullness to the skirt and your train. Note how Duchess Catherine's dress has many deep pleats at the waist. To widen your skirt pattern, cut the back skirt pattern piece(s) in half. Add as much newsprint paper as needed to create pleats.If you want to create a skirt with some volume at the top and a great deal of volume at the bottom, add width at the top to create the pleats and increase the width as you move toward the hem. Make a muslin of your altered pattern to ensure that you've created the look you want before cutting your expensive fabric. Think about how you will walk, dance, and otherwise move around in your skirt with a train. Ask a friend for help managing your train if it is long and cumbersome. Go to a retail store and try on garments with trains to determine the style that you like best. Move around on the skirt or dress to see how easy it is to walk, sit and change directions with the train. Go to a fabric store and look at evening-wear patterns. If you find a pattern with a train that you like, purchasing a pattern will save you a lot of time. Use the pattern as-is, or adapt it to reflect your vision. This is advisable if you are a beginning seamstress. 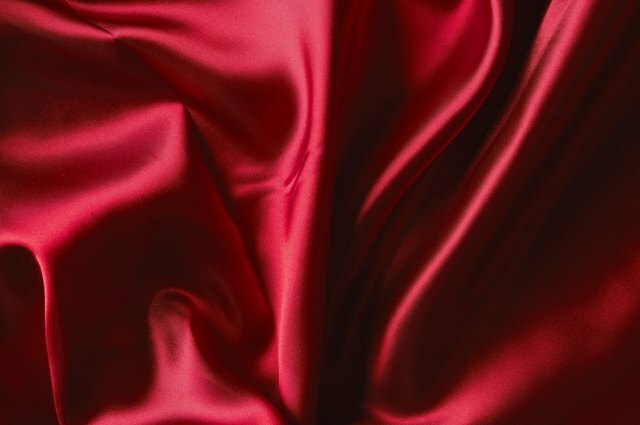 Fabric for bridal or evening wear is often expensive. Making a muslin version of your skirt and train will save you time and money because you'll make your mistakes on the inexpensive muslin. Stitch the muslin train together by hand using a basting stitch so it will be easy to make alterations. Kathleen Koltko-Rivera writes on topics that range from fashion design to finance, and technology to psychology. Her hobbies include genealogy. Koltko-Rivera holds degrees from North Dakota State University, the Fashion Institute of Technology and the University of Central Florida. She is currently a doctoral student in counseling psychology at Fordham University in New York City.